I had already made plans to cook up corned beef and potato hash with eggs for breakfast. Sadly, I didn’t get any pictures. It’s always a struggle to cook breakfast and actually eat it while it’s hot because Rooney’s first bottle of the day usually falls right in the middle of all that. People say you don’t remember what life was like before kids and in some ways they are right. I don’t remember what it’s like to sit down and actually savor a hot plate of food uninterrupted anymore. 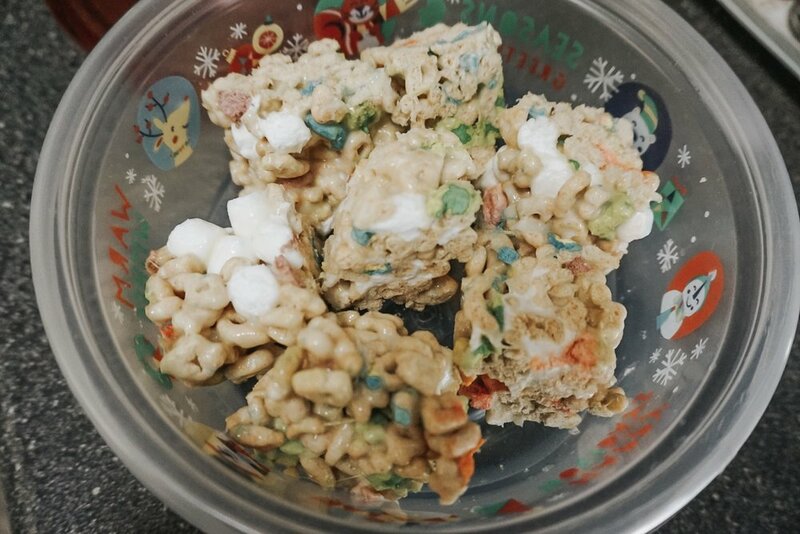 While perusing the aisles of the grocery store by myself Saturday night after a very, very long day with a fussy, teething baby, I decided it might be fun to make some Lucky Charms bars too. I used the Corny Cook’s recipe. She’s another Augusta area blogger and fellow Lidl lover. The sweet treats came together so easily and I ate 3/4 of them over the course of the day. Instead of wasting a whole bag of cereal (we aren’t big cereal eaters), I spent a little extra for the convenience of two of the individually sized cereal containers. It also took asking for help to locate mini marshmallows, which, contrary to my intuition, were not located on the aisle with the baking supplies but rather on the bottom row of shelves under the nuts and individually packaged mini chocolate bars. 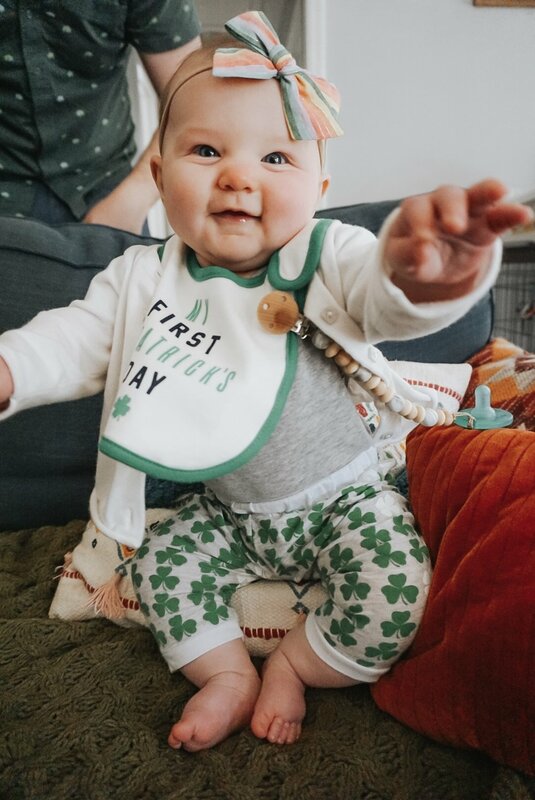 We got a few chores done during Rooney’s naptime and then snapped a few family photos in our green outfits before heading out the door for lunch and a Target run. I’ve been trying to leave my camera out and take more “real” photos of our everyday family moments instead of relying on my cellphone so much. Boy, am I glad I decided to take these snapshots. 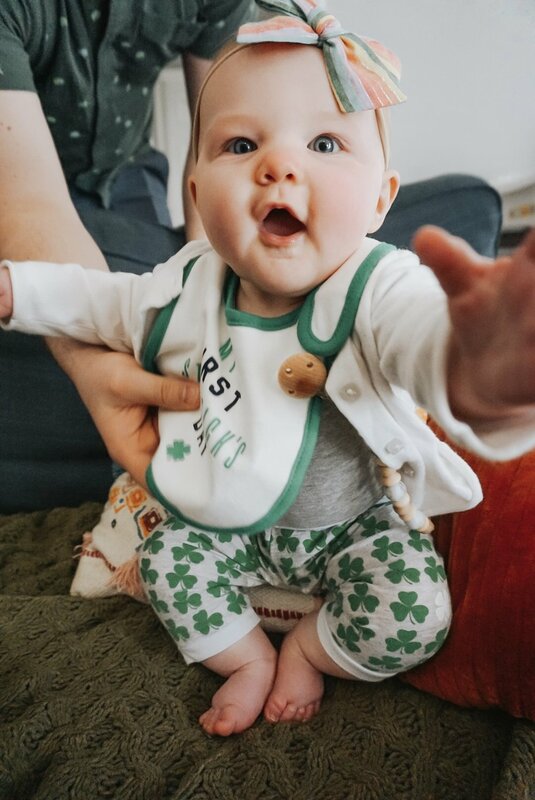 They’re some of my favorite little pics of us from so far this Spring! I recently started using the Honeywild presets and I love how crisp and colorful they make my photos look without them feeling too overly edited. Really embracing the mommy blogging these days! By the time we got home from Target the weather had warmed up so much that we thought it would be a waste not to get outside and enjoy the sunshine. Last week was really rough for me healthwise with some pesky gut issues so I was missing getting outside for walks with the stroller. We were only planning for a short walk but Rooney fell asleep on our stroll so we walked around Hammond’s Ferry and the riverfront for an hour! There were so many people out enjoying the Greeneway. Alex commented on how strange it is to see everyone wearing the same color all day! The fresh air felt so good but I was sure to diffuse our favorite allergy trio of essential oils— peppermint, lemon, and lavender— after dinner to ward off any sneezing from the influx of pollen that has completely blanketed our little town over the past week. Dinner was not traditionally Irish at all. I cooked a way too heavy meal of salmon and pasta al limone from my go-to Bon Apetit recipe. We went to bed stuffed!